Little Pterodactylus, from the late Jurassic period of Bavaria, was one of the first pterosaurs ever discovered (a story you can read all about in my book Beasts of Antiquity). Represented by numerous juvenile and subadult specimens, it's among the better understood pterosaurs as well, especially if you include a few controversial specimens that have recently been argued to represent distinct genera such as Aerodactylus (a conclusion many pterosaur specialists remain skeptical of, but that's a topic for another post). Although many Pterodactylus specimens preserve soft tissue, one pretty important aspect of their biology is NOT so well understood - their crests. 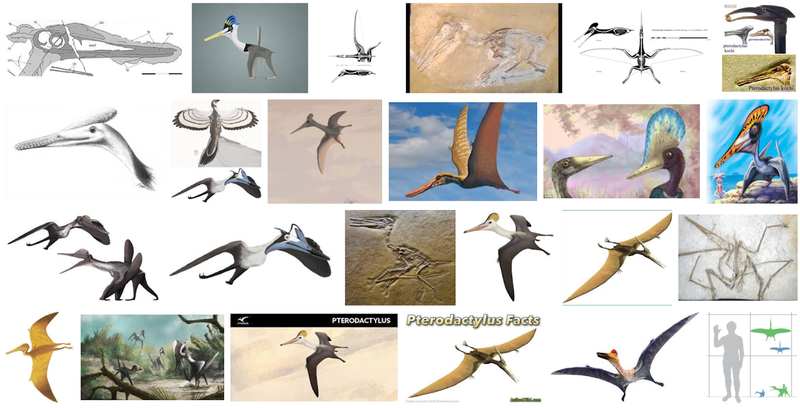 In the past few decades, it has become apparent that crests of one kind or another are a hallmark of most pterodactyloid pterosaurs (and even a good number of non-pterodactyloids). Crests were first reported for Pterodactylus itself by Doderlein in 1929, but it was almost never depicted with a crest in art afterwards. 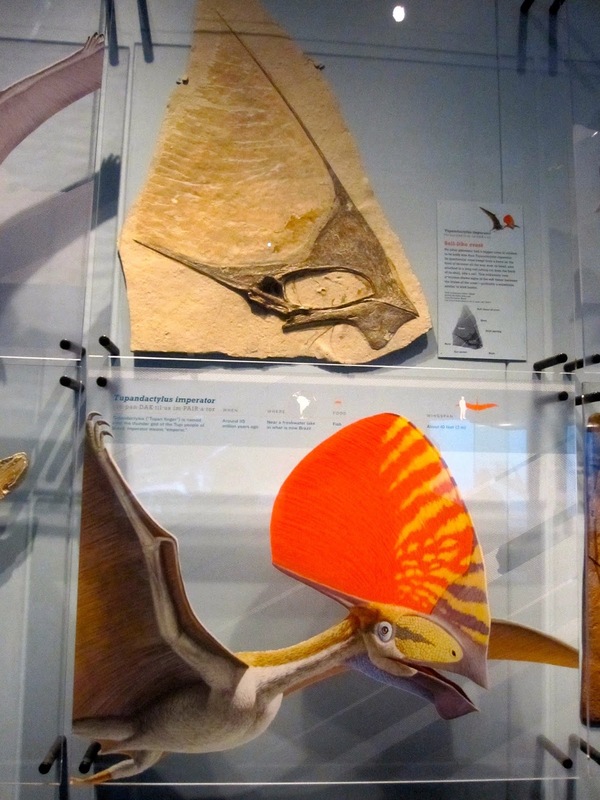 The first-ever crested Pterodactylus was probably a toy. In 1988, Tyco released a crested Pterodactylus toy as part of their "Dino-Riders" line. Though produced under the supervision of Bob Bakker, it's unclear whether or not the crest was based on Bakker's inside knowledge of pterosaurs or was just a lucky guess added to give a fairly plain pterosaur toy more flair. 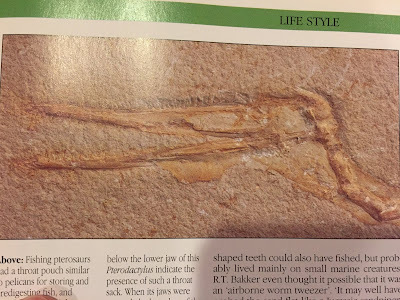 Bakker himself had illustrated Pterodactylus without any crests in The Dinosaur Heresies several years earlier. Despite the fact that Peter Wellnhofer described a lappet "crest" (see below) for Pterodactylus in 1970, and even figured this specimen in his popular 1996 book The Illustrated Encyclopedia of Prehistoric Flying Reptiles, illustrations in that same book depicted Pterodactylus as crestless. 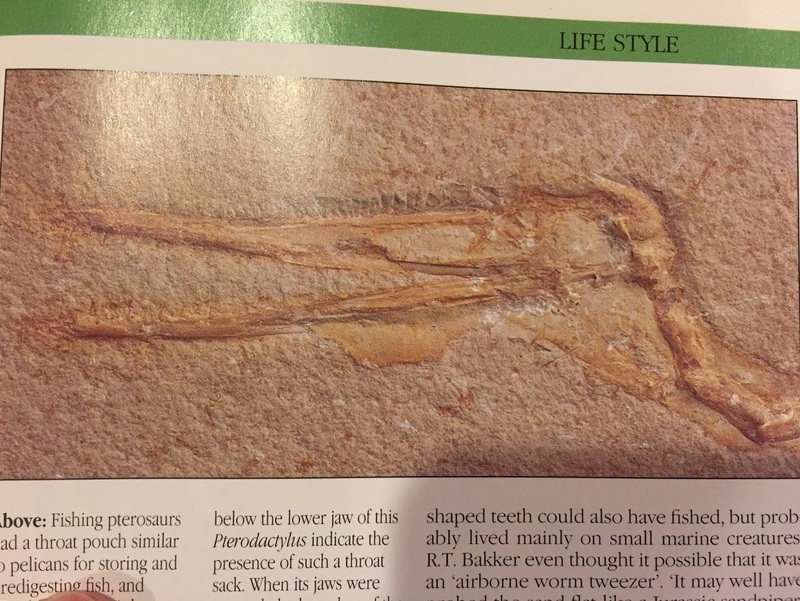 Photo of Pterodactylus specimen BSP 1929 I 18, from Wellnhofer 1996. You can see a thin occipital lappet extending diagonally up from the back of the skull. The dubious Tyco example aside, the concept of a crested Pterodactylus didn't really reach the popular consciousness (and had apparently been forgotten by science, much like several other "modern" ideas about pterosaurs that were really discovered by 19th and early 20th century German paleontologists) until the first ultraviolet florescence studies done by Eberhard Frey and Helmut Tischlinger in the late 1990s and early 2000s. They produced what, at the time, seemed like a very bizarre reconstruction of a pterosaur, especially one like Pterodactylus which was somewhat famous for being the 'crestless one' (as opposed to its more famous, crested cousin, the giant Pteranodon). The illustration that was sent out in press materials about the early UV studies showed a shaggy mane of filaments on the neck, big, floppy webbed feet, a throat pouch, and a big, teardrop-shaped crest that extended above and behind the eyes. Clearly, the UV analysis had totally overhauled our image of Pterodactylus. 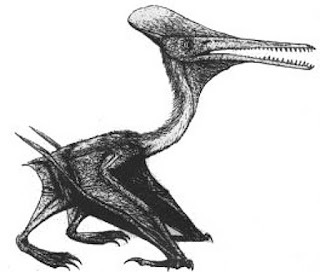 Frey and Tischlinger's reconstruction of Pterodactylus based on UV studies. Or did it? The actual UV papers are still difficult to come by online, so early on it was difficult if not impossible for many paleoartists to examine the source material themselves. In the mean time, Frey's Pterodactylus became the gold standard for accuracy, with savvy artists beginning to incorporate the mane, webbed feet, and distinctive crest into their own work, all based not on any photos or diagrams of fossils, but simply on Frey's pencil drawing. Here's my own early take on the "new" Pterodactylus. Note that, in order to try and be a little different, I applied the UV soft tissue findings to a different specimen, the holotype of Pterodactylus brevirostris (which may actually be a juvenile Ctenochasma!). 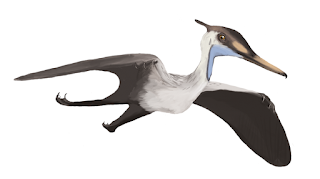 A couple of things turned out to be... maybe not wrong, per se, but definitely speculative and not directly evidence-based, about the Frey-style Pterodactylus. For one, that shaggy mane. Pterodactylus did indeed have a coat of unusually long pycnofibres on its neck. And by "unusually long", I mean that they are nearly half a centimeter long (compared to a ~10 cm long neck), unlike most of the incredibly tiny fibers coating the rest of the body. The "mane", therefore, would probably have appeared as a particularly fuzzy, bristly section of a short, dense coat. As for the crest, none of the specimens show an oval shaped crest extending above and behind the eyes. What the few specimens we have of the crest show is actually two discrete crests or crest-like structures. The main crest, as preserved, is roughly triangular, with its peak just in front of the eyes. A second structure protrudes behind the skull. This has been called the "occipital lappet", and was first noticed by Wellnhofer in 1970. Superficially, the lappet resembles a small version of the crest of Pteranodon. Or, maybe more appropriately, the rear spar of the crest of Tupandactylus. In that tapejarid, the crest is comprised of two bony supports. One, roughly triangular in shape, above the snout. The other, a long horizontal spike, extends behind the skull. In between was an enormous, rounded crest composed of keratin or some other rigid soft tissue. The two "obvious" crests are merely the support struts for these larger structures. Frey imagined that in life, the triangular crest above the eyes and the occipital lappet may have been joined together into this kind of single structure, the apparent shape of the crests as preserved being an artifact of decomposition or post-mortem breakage. This interpretation has been followed by a majority of artists since, as a Google Image search will show. 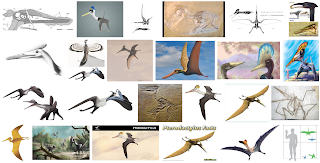 You can see that an image search for "Pterodactylus crest" brings up some fossils and diagrams, 2 reconstructions of Pteranodon (of course), 1 of an ornithocheirid (somebody got confused? ), 1 old-fashioned reconstruction with no crest, 3 different reconstructions with a triangular crest and separate lappet (one of which is my own), and 9 reconstructions with a Frey-style joined crest (again including one of my own!). Mark Witton, in his 2013 book Pterosaurs, was influential in popularizing an even larger tapejarid-like crest, which he included both in his reconstructions and skeletal diagrams. His reasoning for taking the Frey-style crest to the next level was based mainly on the general rule that pterosaur crests tend to be larger than they appear. There are some important differences, though, that we should consider before speculating too much about a tapejarid-style crest in Pterodactylus. First, the two are not particularly close relatives, and tapejarid-like crests have not yet been found in any other pterodactyloid groups. Given the enormous crest diversity among pterosaurs, I'm not sure it's appropriate to assume they were all basically big ovals and differences are just preservational. Some other pterosaurs unrelated to Tupandactylus did have big, rounded crests, but these were more like semicircles erupting from the skull, not extending behind it or significantly above it (like wukongopterids and even some ctenochasmatoids closer to Pterodactylus itself). One other example of "enormous crest supported by bony struts" has been proposed in the form of Nyctosaurus, but despite some spectacular looking restorations out there, it's unlikely those enormous spars supported any soft tissue. The huge, oval-shaped crest of Tupandactylus was supported by long bony crests that graded into soft tissue, unlike the totally soft crests of Pterodactylus. Photo from the AMNH pterosaur exhibit by Lisa Brormann. Second, the supposed spars of the Pterodactylus crest are not made of bone! The reason Tupandactylus and other tapejarids can have those huge oval crests sitting on their heads is because they have bony supports. Even the smaller species like Tapejara wellnhoferi has a significant hard, bone-based component to its (possibly) large oval crest. 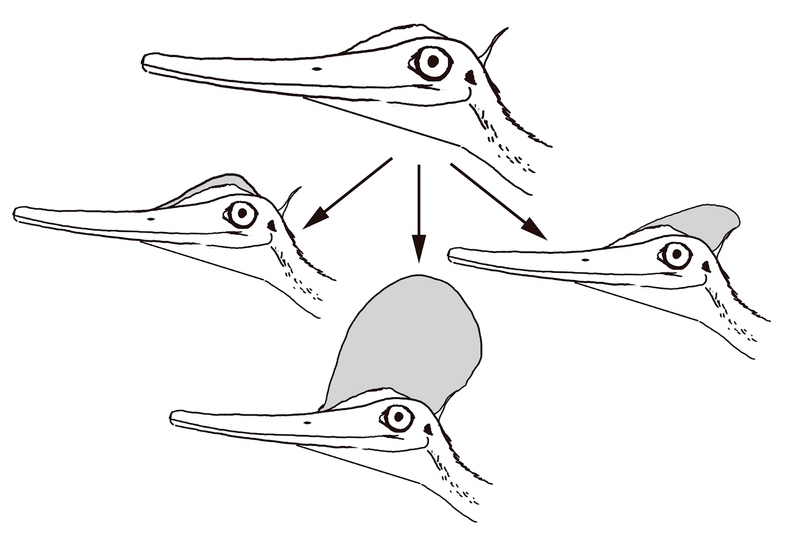 In Pterodactylus, not only is the main crest comprised entirely of soft tissue with an unusually minimal amount of bone as an underlying base, the occipital lappet is not made of keratin at all. Upon close examination of the internal structure of the lappet, it seems to be supported internally by twisted fibers similar to those that make up the pycnofibre coat. The lappet would not have been flat in life, like the crest of Pteranodon, but conical. The fact that it is composed internally of fibers may imply that it was flexible, a result that would explain why it is preserved in different positions in different specimens (some curving upward, some straight). The lappet seems to have been more an extension of the skin integument than a typical crest, sort of like the wattles and caruncles of a turkey. Possible crest reconstructions for Pterodactylus (based on specimen BSP 1929 I 18). Clockwise from top: Crest and lappet as preserved; joined crest after Frey 2002; joined crest after Witton 2013; minimally extended unjoined crest. Diagram by M. Martyniuk 2018, all rights reserved. It's entirely possible that future specimens will show that we have Pterodactylus crest shapes wrong, or that the main crest was in some way attached to the lappet. But given the evidence right now, that interpretation is one of the less likely possibilities. A few prominent paleoartists who helped popularize the tapejarid-style crest have since produced lappeted ones, including Mark Witton and John Conway, both of whom, intriguingly, depicted the lappet as just part of the larger pycnofiber assemblage - Conway as an extension of the "mane", Witton as part of a larger set of display fibers). You can read more about Witton's new Pterodactylus reconstruction on his blog. All of these reconstructions still go a bit beyond the known evidence by depicting large, flamboyant crests. As they probably should - Witton was correct when he pointed out that pterosaur crests were probably larger, in general, than traditionally thought. All of our crested Pterodactylus specimens are also sub-adult, so even though the soft tissue crests we have preserved seem to be pretty small, it's likely the crest would have gotten at least a little bigger with maturity. We just don't know how much bigger. Reconstruction of a subadult Pterodactylus by M. Martyniuk. 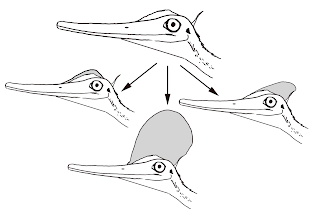 The variation in soft-tissue crests in pterodactyloids makes me wonder if they're to some degree controllable surfaces like the wattles, dewlaps, and throat pouches of lizards. Not sure what muscles would be available, you know, ON THE SKULL to control such a system but it could be as superficial as the tiny skin muscles that cause hair/feathers to fluff up.